In a previous post we described how declining Catholic fertility rates have led to fewer baptisms (rather than this being related to any growing reluctance among parents to baptize their children). In this post, we show the effect this has had on Catholic family sizes over time. 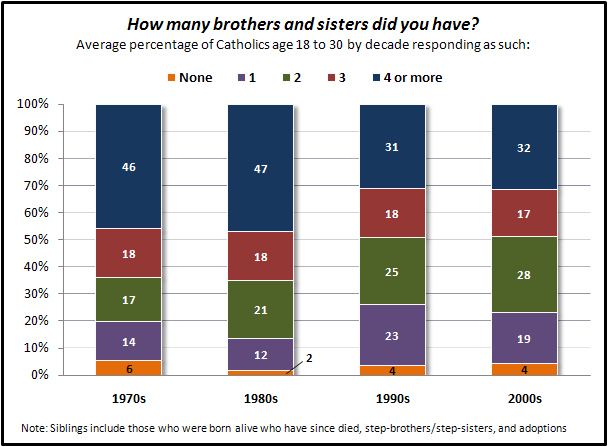 As the figure below shows (data are from the General Social Survey or GSS), a majority of young self-identified Catholics (age 18 to 30) in the 1970s and 1980s had three or more siblings (including step-brothers and sisters and adopted siblings). In the 1990s and 2000s, a majority have two or fewer siblings. A Catholic family with five or more children (the respondent and at least four siblings) has become harder to find, dropping from nearly half of young Catholics reporting this in the 1970s and 1980s to less than a third in the 1990s and 2000s. The rarest case is still the single-child family. Very few young Catholics in any decade report having no siblings. The number of step-siblings has likely been on the rise as well as some of those who divorce and remarry have additional children. If both original spouses do this it creates a multiplier effect on the number of siblings. 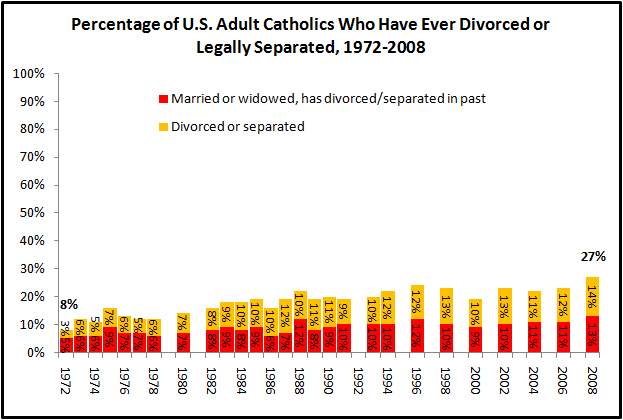 In the 1972 GSS, 8% of adult Catholics reported that they had ever gone through a divorce or legal separation in the past (3 percent were divorced or separated at the time and 5 percent had been divorced or separated in the past and were now married or widowed). This figure has risen steadily over the years and in the most recent GSS it was estimated to be 27%. Note that just because a GSS respondent self-identifies as Catholic it does not mean that their siblings do. Also, even though the fertility rate in the United States is approximately two this is not a direct indicator of average family size. Many women do not have any children. Other women have more than two (as reflected in the sibling results). The GSS results for 'ever having been divorced' are consistent with CARA's own polling of adult Catholics. Above photo courtesy of trontnort at Flickr Creative Commons. 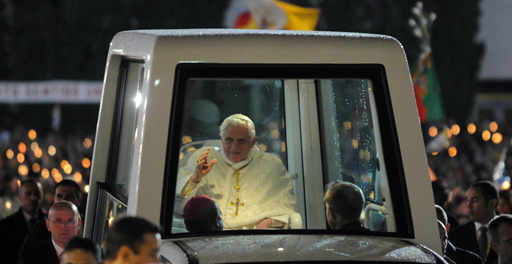 The size of the Catholic population in Britain has changed little since the last papal visit in 1982 (growing only 2.7%). The most recent Vatican estimates indicate just fewer than 5.2 million Catholics in Britain (England, Wales, and Scotland). 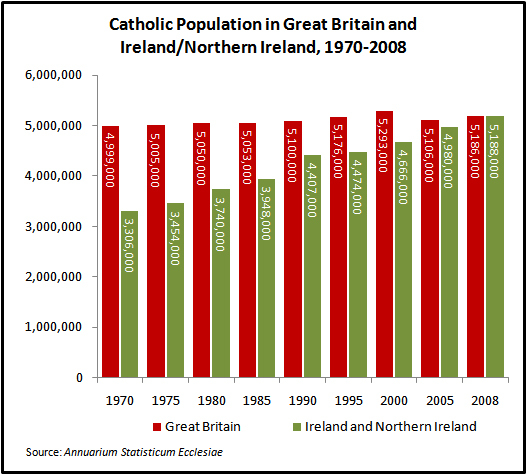 There is also now nearly the same number of Catholics across the Irish Sea in Ireland and Northern Ireland combined (the Vatican does not provide an estimate for Northern Ireland alone in the Annuarium Statisticum Ecclesiae). Underlying the stability of the size of the Catholic population in Britain are indications of potentially significant change. 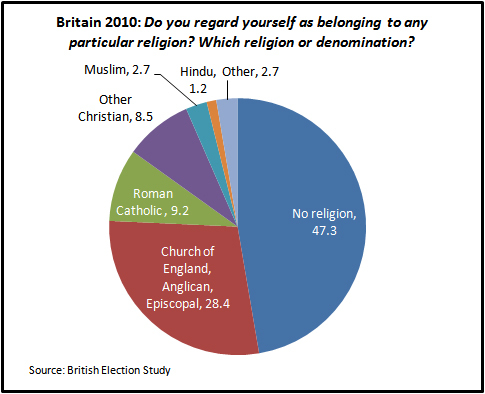 A British online panel study (the same respondents are interviewed over the period of several years) conducted as part of the British Election Study (BES) series estimates that as many as 13 percent of those who self-identified as Catholic in 2005 no longer did so when interviewed in 2010. Most of those who left Catholicism (76%) did not join another religion and instead now report that they are not a member of any religion. Yet the panel study also shows that this changeover has had little if any impact on the size of the Catholic population because a similar proportion of respondents who were not Catholic in 2005, have converted (or returned) and now self-identify as Catholic in 2010. These changes are similar to the shifts identified by the Pew Forum on Religion and Public Life in the United States (the British survey only measure changes over five years, whereas the Pew survey measures changes over a longer time frame in reference to one's childhood faith. Thirty-two percent of Americans raised Catholic are estimated by Pew to have left the faith, representing 10.1% of the U.S. adult population. CARA's shorter-term estimates for change in the U.S. are available here). According to the most recent BES 2010 (using in-person interviews), 9% of the British adult population self identifies as Catholic. The largest religious faith is Anglican (i.e., Church of England, Episcopal) at 28%. Yet, many respondents say they do not have a religion (47%; up significantly in the last decade). This proportion is much larger than estimates for the unaffiliated in the United States (Pew estimates this to be 16%). 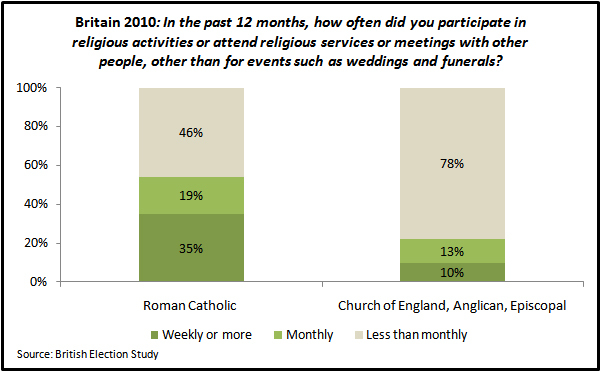 Although fewer in number, Catholics in Britain are more likely than Anglicans to indicate that they regularly attend religious services. Thirty-five percent of British Catholics say they attend Mass once a week or more often and 19% say they do not attend weekly but go to Mass at least once a month. By comparison, just one in ten Anglicans attend services weekly and 13 percent attend at least once a month (all of these attendance estimates are likely overestimated due to social desirability pressures; see: The Nuances of Accurately Measuring Mass Attendance). The difference is very significant because it means that the number of weekly church attending Catholics (3.2% of the total adult population) is greater than the number of weekly church attending Anglicans (2.8% of the total adult population) in Britain.